Primitive Hand painted set of 3 tall round Snowman and Snowflake stacking boxes. Perfect for the winter season! 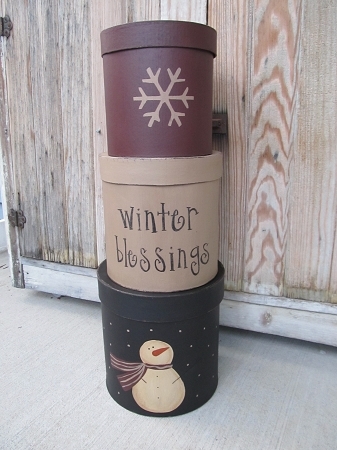 The design features a black colored bottom box with a hand painted snowman with Burgundy scarf. Little snowflakes fall around him. Middle box is a khaki tan color with the hand written saying of your choice. Shown with Winter Blessings. The top box is Burgundy with a khaki tan colored snowflake. All sanded and stained for a worn antiqued look. Size stacked is 25" and the bottom box is 9" round. Hand painted, designed and signed by Heidi.